The sound of two shots were to become the beginning of a tragedy. One after another, the beautiful girls are killed. Was it a crime committed by one within the mansion? Is there one without an alibi? What is the motive? Shigeki and his friend Shû become drawn into a nightmarish investigation, when the inspector finds evidence after evidence pointing towards the murder still being within the mansion. Are they really forced to suspect somebody among them? The parents? The servants? Themself? Will it be too late once the horrible truth is unveiled?Tsutsui Yasutaka has not written many detective novels (推理小説), in fact there are only three works in that genre he published. There is Fugô Keiji ~ Det. Millionaire [富豪刑事], Feminizumu Satsujinjiken ~ The Feminism Murder Case [フェミニズム殺人事件] and finally this here. 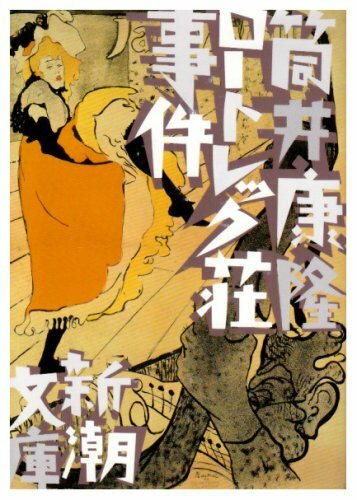 Fugô Keiji was even turned into a TV-Drama and met some praise, but was ultimately considered a mediocre work by the author himself because it didn’t really meet detective novel standards. This is actually not much of a surprise when you consider that Tsutsui normally writes in the genre of SF or satire. Some people might know one or two of his more famous works, Toki o kakeru shôjo ~ The Girl Who Leapt Through Time [時をかける少女] or Paprika [パプリカ] which were both turned into anime features during the 2000’s. It’s no surprise that he was not that much familiar with writing detective novels and said to have had some problems while coming up with a trick. Still I agree with the author of the commentary of the Bunko-edition, you not only have to praise an author for following expectations, but also for adding something that is neither following nor destroying expectations but simply adding something new. Does Lautrec Manor really do that though? Well, for 1990’s standards it actually does, considering that it had only been some years after the New Orthodox School revived several classical trickeries and to actually play with the genre didn’t become en vogue until some years later in the mid 90’s. His trick might have been considered unfair by standards of 1990 (for those not familiar with considerably new authors like Ayatsuji Yukito), but today it would almost be considered a classic example of a certain kind of trick I won’t name here to keep some of the suspense. I even have to admit that it’s not among the most difficult tricks I have encountered so far. There are no complicated locked room scenarios or impossible murders, it’s all about not wanting to blame an innocent person. There is actually one trick perceived by characters later in the book, but by then most people of todays standards will probably have figured it out. Still, the way the novel was built up was suspenseful and it made perfect use of it’s approximately 200 pages. It wasn’t too long or too short, well maybe the confession could have had 2, 3 pages less, but that’s about it. It keeps you guessing and waiting for new events to come and the final solution, especially to the whydunnit and the aftermath of the tragedy are really well delivered. In contrast to Nagai Ie no Satsujijn, I actually cared for the culprit as well as the victims and it made for a pretty powerful last page. Considering that, especially the last pages of the last books I’ve read were pretty intense, with very hard hitting final lines. I wish every book would be able to deliver a satisfying conclusion like that. And I can say that even though the plot of Lautrec Manor wasn’t nearly as intricate and constructed like a Kyôgoku or Ayatsuji. It had a refreshing simplicity, concentrating on what it wanted to do and being really strong in that department. Actually some of the red herrings really got me for a while, but I really wanted to solve the mystery this time around as well, not as with Kyôgoku where you give up trying to solve anything because you’re too distracted by everything else. I have no problem with being distracted, but it’s really nice to see something else once in a while. ~ by seizonsha on 2011/03/15.